We are your go-to provider for data sheets, tools, service manuals, videos, and product brochures. Central States Industrial (CSI) provides you with the highest quality resources to get the job done. Select a brand above to view the resources available. Then, create and personalize your dashboard to save and quickly reference frequently viewed resources. Check out our library of videos, including product information and how-tos. Ready to get technical? Our white papers go in-depth on a number of technical issues. Do you need innovative solutions? Check out our blog content to get some ideas. Is there something else you need to know? Browse for even more literature and information. Need help finding the right fitting? Browse these references, or give us a call to select the right fittings for your needs. The world of stainless steel is diverse. 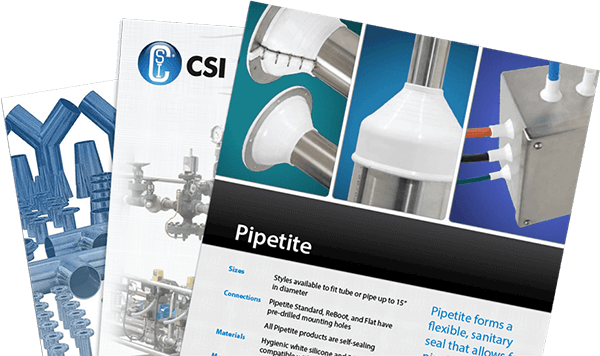 At CSI, we provide you with industry-leading expertise in alloys used in the sanitary process industries. CSI holds its products to strict standards. Learn more about the specifications we use here. Tell us what you need, and we can send it to you. Literature for Resources have been saved to your dashboard! Literature for Resources are already in your dashboard.